Ever since its inception in 2001, the Agile manifesto and the Agile project management methodology has been primarily thought of, as a tool for software companies to drive productivity But what about non-IT, non software companies? Don’t they deserve to be productive and gain efficiency using the best practices available? Of course they do - there are several examples of best practices shared across industries and industries getting benefited. One of the most famous is the Lean methodology of startups and software development that was taken from the manufacturing industry. Surprising yet true - 48% of project managers use Agile software for non IT related projects. Story mapping and analytics are close second at 89%. Scrum boards and activity streams are the third with 85% people’s votes. 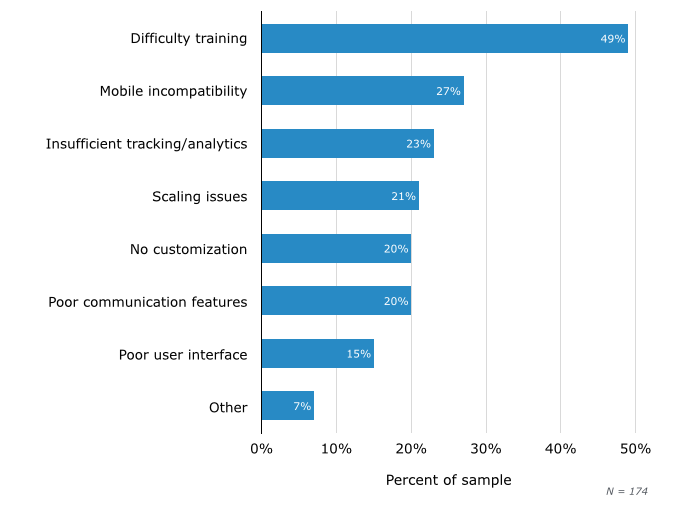 Biggest challenge for about half of the users is to train others about using Agile tools. 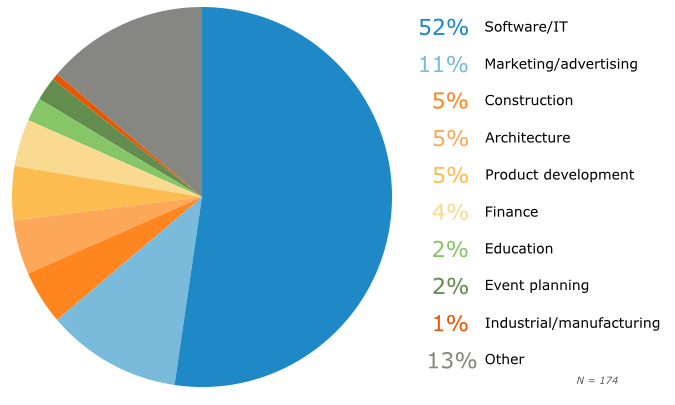 Nearly half of the respondents already used Agile tools for non IT projects - This is really surprising, because deep down I had assumed that Agile is a property of software domain. But the news that there are several companies who are already reaping the benefits of Agile methodology in their own fields is intriguing. How do they do it? What features they use? But if you let this sink in, you’d come to agree, Agile methods translate well to any kind of project. For example the activity stream - every manager would love to have a bird’s eye view of what everyone in his team is up to. Another example, workflow management, is applicable to any project you can think, almost all types of projects are now multi-location. As a project manager of a non IT project, it is high time you take a plunge and try a Agile development tool. Taiga is a rare combination of open source and beautifully designed, agile focussed project management tool. You can try out Taiga without any contracts, do it now! The most used feature is workflow management and story mapping - This is quite understandable. 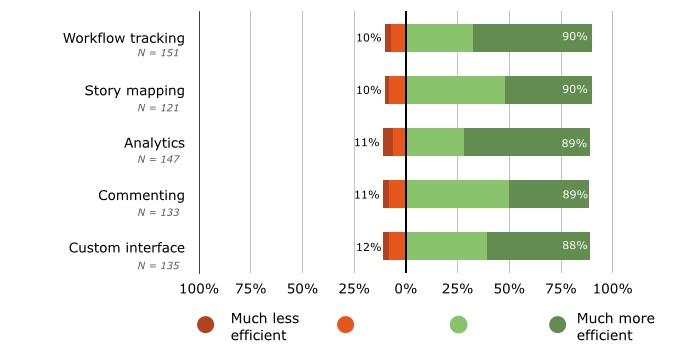 Workflow tracking is among the most effective: 90 percent of respondents say it makes them “somewhat” or “much more efficient.” Story mapping is also ranked most effective by 90 percent, while analytics rounds out the top three at 89 percent. Having consistent, clear analytics—typically on project timeframes and success rates—can help identify challenges in the early stages, before they become unwieldy and derail a project. Taiga has a very well designed intuitive interface that can help people quickly take a look at what is going on. You can even create charts/graphs if you want to. About half of the respondents felt, training others on how to use the tool is the biggest challenge - More so because of non IT workforce. The employees and managers are generally not aware of Agile methodologies and the tools, and teaching them appears to be the biggest challenge. Other challenges include mobile incompatibility, insufficient analytics, scaling issues etc. With Taiga, almost all of these risks are mitigated to a great extent. The extremely simple to use UI is self explanatory and easy to use even for the non experts - they just need to know the key words. Here is a playlist of small videos to help anyone get started with Taiga. For people worried about mobile compatibility, Taiga is completely responsive - you can use it on any device. Scaling issues are non existent with the web based SaaS model. If you are a non IT project manager, I hope this study encourages you to get started with Taiga - and reap the benefits of Agile methodology to the greatest possible extent. Armed with this thesis, online project management technology advisory firm Software Advice conducted a study to understand how far is adoption of Agile tools in non IT sector and how do the decision makers in non IT sector perceive Agile tools.